During a recent goodwill visit to Bombardier’s Toronto assembly plant, a member of the C Series jetliner flight crew apologized for the lengthy wait. He was pointing to the lineup of journalists and guests queueing to visit the flight deck. He could have just as easily been talking about the long delayed arrival of the first clean design, narrowbody jet in more than 15 years, and the first in its category in 30. None of that appeared to matter. As the airplane sat on the tarmac, sparkling in the bright red and white livery of launch customer, SWISS, concerns over program delays and a thin order book melted away under the sun of an unseasonably warm September morning. Still, it was back to business immediately after the CS100 slipped quietly out of Toronto, with a cheeky fly past over Billy Bishop Airport, an urban facility where Porter Airlines potential order for up to 30 CS100 for trans-continental service hinges on a vote by City Council to extend the runway and allow for commercial jets into the waterfront airport. It was at the 2008 edition of the Farnborough Air Show where Montreal-based Bombardier, pioneer of the regional jet concept, ended years of speculation by green-lighting the C Series family of airliners aimed at filling a gap between the smallest Airbus A320s and Boeing 737s, and the smaller regional jets (the CS300 does invade A320 and 737 territory with a high density layout of 150 seats and maximum capacity of 160 seats). Even so, the number three airframer was taking direct aim at Airbus and Boeings’ bread and butter product line. The two giants responded with re-engined versions of their popular and well-established aircraft and advantages in size, supply chain, deeper pockets and cut throat pricing to offset the added cost of a slightly larger airplane to beat out Bombardier at almost every turn. The Canadian plane-maker didn’t aid its cause with chronic delays, including a grounding of the test program following an engine failure, and clearly lost potential customers including Qatar Airways, while making the existing customer base jittery. But it was more likely when going nose-to-nose against Airbus and Boeing that customers would want to see the goods before placing an order. The C Series made a splash at the Paris Air Show earlier this year with an unprecedented “beating the initial brochure” announcement that both the CS100 and CS300 will exceed original targets for fuel burn, payload range and airfield performance. The market liked what it saw, and the airplane even won rare praise from its rivals as a technologically and economically promising airplane. Bombardier says the C Series will be 20 per cent more fuel efficient than current narrowbodies, and 10 per cent more efficient than the Airbus A320neo and Boeing 737 Max series. The lead that Bombardier once held in entry into service over the newer versions of the A320 and 737 has largely evaporated. Large orders for the established airplanes have been locked in raising the question; is there room in their fleets to integrate not only another airplane, but a new type of aircraft altogether? Not surprisingly, Cromer believes so and has the boardroom battle scars to back up his analysis. In addition to having served as chief financial officer for Continental Express, Cromer has spent a career matching airplanes to routes as vice-president of fleet planning for Continental Airlines (now United) and director of fleet planning for Northwest Airlines (now part of Delta). He sees the advantage in operating a family of aircraft in terms of less investment in spare parts and people to support the aircraft, but to a point. Bombardier estimates that 80 per cent of departures worldwide carry less than 150 passengers. “So there is a family benefit [in fleet planning], but there is not a member of the current family that delivers the economics in the market we are going after,” Cromer said. The airframer forecasts demand for 12,700 aircraft deliveries in the 60- to 150-seat range over the next 20 years, including 7,000 deliveries of aircraft in the 100- to 150-seat range. Over 90 per cent of the CSeries aircraft certification program was complete at the time of writing and the CS100 is expected to be certified in November. “Over the next few weeks, the CS100 takes to operating on a commercial airline-type schedule from key airports in North America,” Rob Dewer, vice-president of the CSeries Aircraft Program maps out. 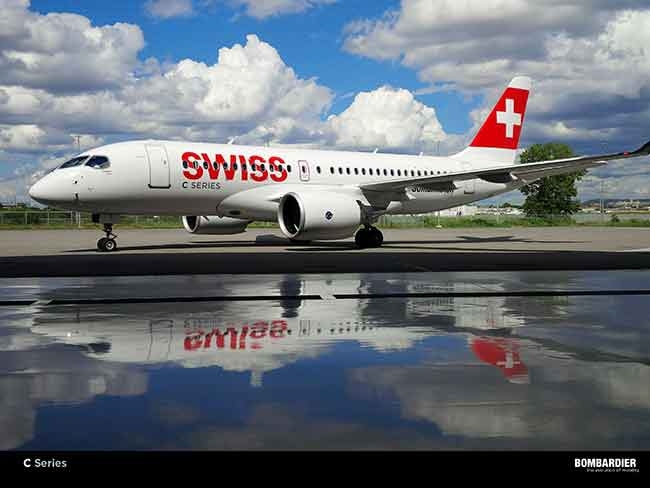 The CS100 aircraft is expected to be in operation with SWISS in the first half of 2016. The final tests will be conducted using typical airline flight routings and operational procedures, stopping at dozens of airports in Canada and the United States, where Bombardier is hungry for a breakthrough order after a 14-month sales drought. Perhaps the brightest prospect for now is United Airlines, a Star Alliance partner with Air Canada, and an airline that Comer is likely most familiar with from his time in fleet planning at Continental. According to Bloomberg News, United plans to order a fleet of either C Series or re-engined Embraer E-Jets, pending the successful outcome of bargaining with its pilots. Comer believes that the C Series has it all over its Brazilian rival. Pricing of the C Series has been an obstacle for Bombardier. The cost of the CS100 is pegged at US$63 million, and US$72 million for the larger CS300. The Canadian manufacturer does not have the resources to match the discounting of Airbus and Boeing. Comer prefers to leave price negotiations at the bargaining table, but indicates a shift in thinking on pricing in Montreal. “The business case is different today than when the aircraft was first developed,” he points out. “We need to figure out ways to develop the aircraft more cost efficiently.” Which may have been the thrust of Bombardier’s recent talks with Airbus. Production ramp-up at Bombardier is underway with SWISS scheduled to take delivery of the first batch of 10 CS100s in 2016, replacing its existing fleet of Avro Regional Jets, and 10 CS300s in 2017. Bombardier’s order book currently stands at 603 aircraft, but only 243 of these are firm orders. Some of the commitments on the books, such as Porter Airlines and a U.K. upstart that plans to operate the CS300 from London City Centre Airport to New York would showcase the urban and trans-Atlantic capabilities of what is a truly versatile airplane. But does Bombardier have time on its side? The margin for error is thin and the C Series strongest marketing advantage will be if Bombardier can introduce into service an aircraft that has already been pushed significantly up the bell curve.